you should feel really bad for me. i live in a house with a spouse who does not like sweet potatoes. in any form. preheat oven to 450. drizzle a rimmed cookie sheet with olive oil and rub around with your finger to coat it evenly. arrange sweet potato spears in a single layer on the sheet, skin sides up. drizzle tops with more olive oil and season with salt & pepper. roast for 20-22 minutes, or until tender when pierced with a fork. while potatoes are roasting, heat a small skillet over medium-high until hot. add the walnuts and toast them, stirring occasionally, until they are fragrant, about 2-4 minutes. transfer to a large bowl. when the potatoes are done, allow them to cool for a few minutes, then add them to the large bowl with the toasted walnuts. squeeze in the juice from the lemon, and add the feta and chopped parsley. drizzle in a little more olive oil and season with salt & pepper. gently toss to combine. we love us some asian dishes around here..
our favorites that we pretty much kept on repeat were these asian turkey meatballs and these chicken lettuce cups. now that the husband is about to cross the finish line on his challenge (which by the way he did wholeFORTY 😐 overachiever), i am excited to re-introduce a few things into our diet at home, including rice! this recipe – IT’S AMAZING Y’ALL. it is not just your average side dish that comes to you in the chinese restaurant.. it’s super creamy and tons of flavor comes from the coconut milk. and i will tell you, i am not a huge fan of coconut itself, but cooking with coconut milk is totally different and i love the flavor of it. this is a super simple recipe and one that is sure to become a kitchen staple in your house too. in a medium sized saucepan, combine all ingredients. heat to boiling over moderate high heat. once boiling, reduce heat to low and cover. cook rice for 12-14 minutes until all water has been absorbed. fluff with a fork and serve along with your favorite asian main dish. there are often days when i am dragging like crazy in the afternoon. days when i did not get that second cup of coffee in the morning and by 2 pm all i want to do is go crawl back in bed and go to sleep. usually i try to snack on something packed with protein for a pick me up, whether it’s a hearty homemade granola with loads of chia and flaxseed (on a good day) or a huge spoonful of peanut butter with an apple (on a normal day). mix all ingredients well in a bowl with a spatula or your hands. roll into 1-inch diameter balls (packing them as you roll so they hold their shape). place on a small plate and refrigerate for at least 30 minutes before eating so they can firm up. transfer to an airtight container – will keep for about a week in the fridge. ok, so imma be real with you. like pretty much every time i make it. no matter how closely i listen to the microwave as it’s popping, i still burn it. then i deliver the sad attempt to my husband, head hung low. every friggin time. so until i can learn to pop popcorn correctly – and this is not a paid ad – i will remain a HUGE fan of angie’s boom chicka pop. a friend and a client introduced me to it a couple years ago and i have kept it stocked in our pantry ever since. 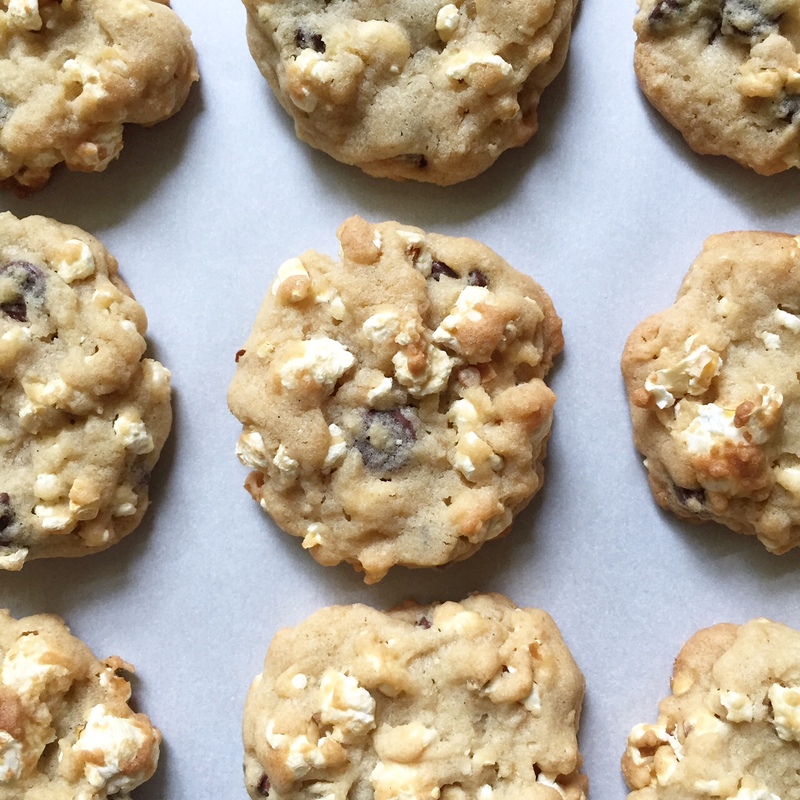 naturally when i came across the idea to put popcorn into a cookie – and it called for popping your own in the microwave for the recipe – i was all, SHYAH RIGHT, i got this. i adapted a recipe from my favorite design magazine, canada’s house and home (like these maple pudding cakes) and these have quickly become a favorite in my house. the savory, salty element in these cookies is awesome.. and the combination of it with the melty chocolate chips is THE JAM. preheat oven to 325. place top rack in lower third of the oven. line 2 large baking sheets with parchment paper. in a medium bowl, whisk together flour, baking soda, and salt. in a separate large bowl, beat butter and sugars together with an electric mixer until smooth. add egg and vanilla, and mix until combined. with a spatula, stir in dry ingredients. then mix in the popcorn, and then the chocolate chips, until evenly distributed. with a 2-tbsp cookie scoop or large spoon, drop cookies about 2 inches apart on the prepared cookie sheets. with clean fingers or a fork, smash them down a bit. bake for 12-13 minutes, until cookies are browning around the edges.